We who sign below object to the sale of kangaroo meat to China in the free trade agreement. The current commercial slaughter is cruel, unjustified, unscientific, and is devastating to Australia’s kangaroos . Research has established that kangaroos are not in epidemic / “plague” proportions, that farm waterholes play no part in increasing kangaroo numbers, that few joeys survive, in fact only 25%, survive to adulthood. The kangaroo killing industry has been protected as if it were a national savior of Australia’s rural economy, supported by a series of myths which no one ever bothers investigate. The industry claims that kangaroo grazing contributes to 30% of grazing pressure, when this is totally untrue. A female kangaroo and joey have as close a bond as primates. Each decade, over 30,000,000 are killed, leaving one million orphaned joeys, to die from chilling, starvation, attached by feral animals, each year. Kangaroos are not killed hygienically in an abattoir and injuries are not monitored at the point of kill because the kill is un-policed. There is no potable water, to wash knives, hatchets, the ute, hanging hooks for inside the chiller boxes. Kangaroos are shot in the outback at night in unhygienic conditions, disemboweled among the faeces of other animals, dirt and dust and insects. In 2009 Russia banned kangaroo meat due to hygiene issues. Raw kangaroo meat can carry hydatids, nematodes, parasitic worms, and other bacterial fungal and viral diseases, such as salmonella and E-coli. Wake up Australia, while there’s still time to save your wonderful kangaroos. Stop killing kangaroo’s . 30 million Australian kangaroos are brutally shot, their joeys are decapitated. You don’t have to be Einstein to understand this is unsustainable. 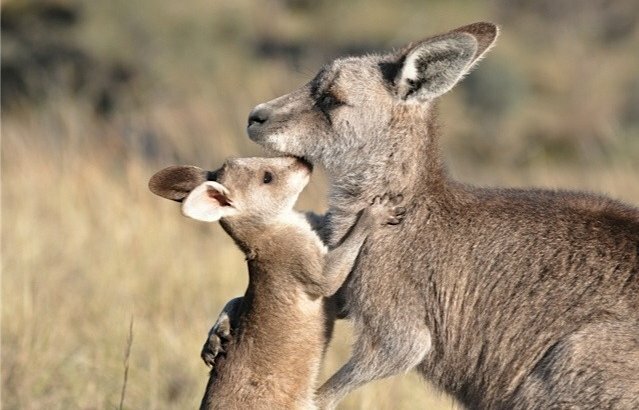 If you want kangaroos to be here for your grandchildren stop killing them now. Australia you are an embarrassment to the world, most people love the kangaroos and dont want to see them hurt and brutally slaughtered.